This 1871 image is among never-before-showcased images captured by pioneering British photographer Eadweard Muybridge, due to be exhibited for the first time in the UK later this year. The exhibition will feature lighthouses from the photographer?s commission for the US coastguard, said a spokeswoman for Tate Britain in London, which will host the show in the autumn. 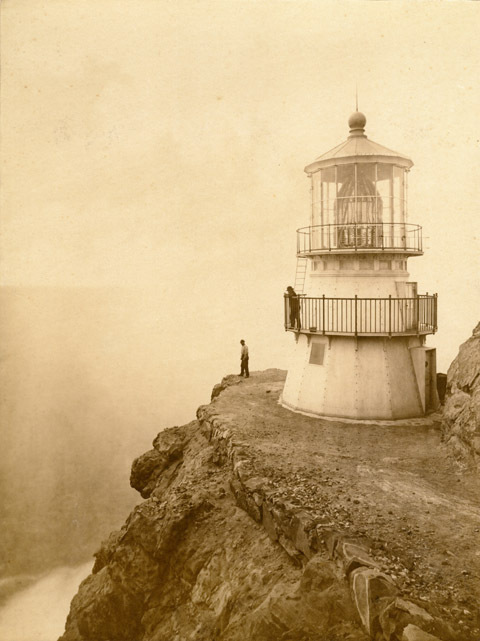 The image revealed here is entitled First-Order Light-house at Punta de los Reyes, Seacoast of California, 296 Feet Above Sea (4136), 1871. Muybridge was known for his ability to capture motion using multiple cameras, among them images of a horse. Captured in 1878 the images revealed that – when galloping – the animal?s hooves all leave the ground. The Tate Britain spokeswoman told Amateur Photographer: ?We are also going to be showing some of Muybridge?s cyanotypes from 1885? As there are no negatives of Muybridge?s work in existence, these cyanotypes are the closest we can get to the original images he created and give a new insight into his work as they reveal how he altered them ? cropping and cutting them – in order to create the final images we see in his motion sequences.? The exhibition – billed as the first in the UK to explore the full range of Muybridge?s work – runs at Tate Britain from 8 September 2010 -16 January 2011.